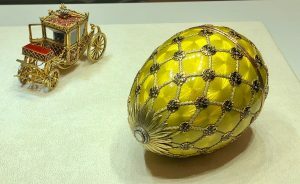 The Season of Gift-Giving is upon us, and though most of us won’t be giving away Imperial Easter Eggs by Faberge, it’s fun to see gifts fit for a tsarina. 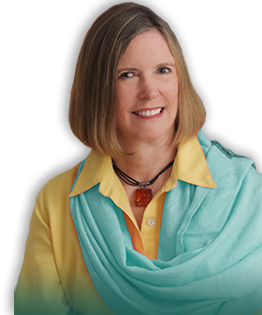 I include the Imperial Eggs this month rather than the Easter season when they were given, because they’re very much a part the series on St. Petersburg. In tsarist Russia, Easter eggs contained magical powers of protection and prosperity. 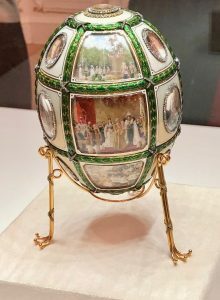 The first Faberge Egg was created in 1885 when Tsar Alexander III gave his wife the Hen Egg. 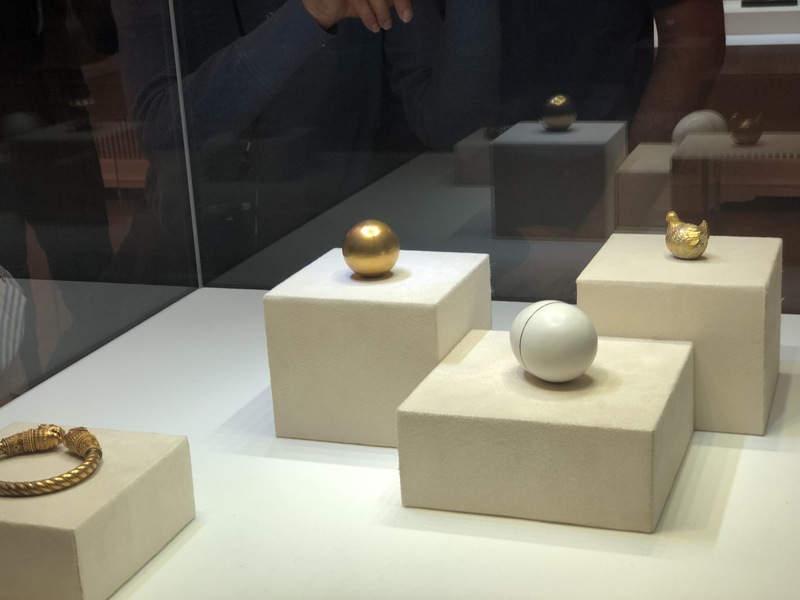 Originally, the white enamel shell opened to reveal a yellow gold yolk, which opened to reveal a hen, which opened to reveal a diamond replica of the Imperial crown. The tsarina was delighted, and the custom continued among members of the royal family and their friends. 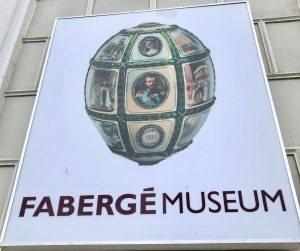 Faberge was free to design the eggs however he wished, so long as each egg was unique and contained a surprise. 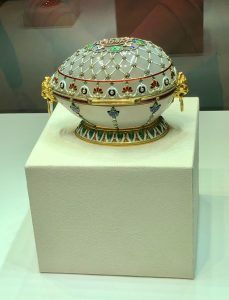 Alexander III presented this Renaissance Easter Egg Jewelry Box to his wife in 1894. The following year, Alexander’s son Nicholas gave his wife the Rosebud Easter Egg. To commemorate his ascension to the throne, Nicholas II gave the new tsarina The Coronation Easter Egg in 1897. The carriage is an exact copy of the coronation carriage, complete with moving parts. The Fifteenth Anniversary Easter egg is the only one with portraits. 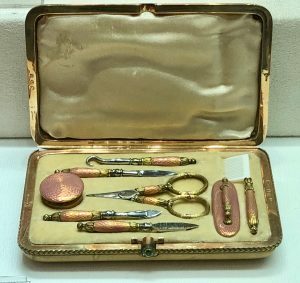 The golden shell is covered with guilloche enamel. The miniatures are watercolors on ivory. The center picture appears to be Nicholas II’s coronation. 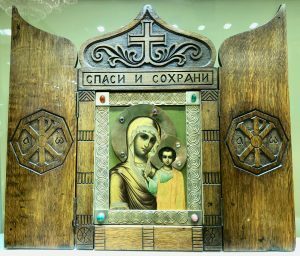 Nicholas II gave the Order of St. George Easter Egg to his mother in 1916. The simple design is in keeping with wartime austerity during World War I. 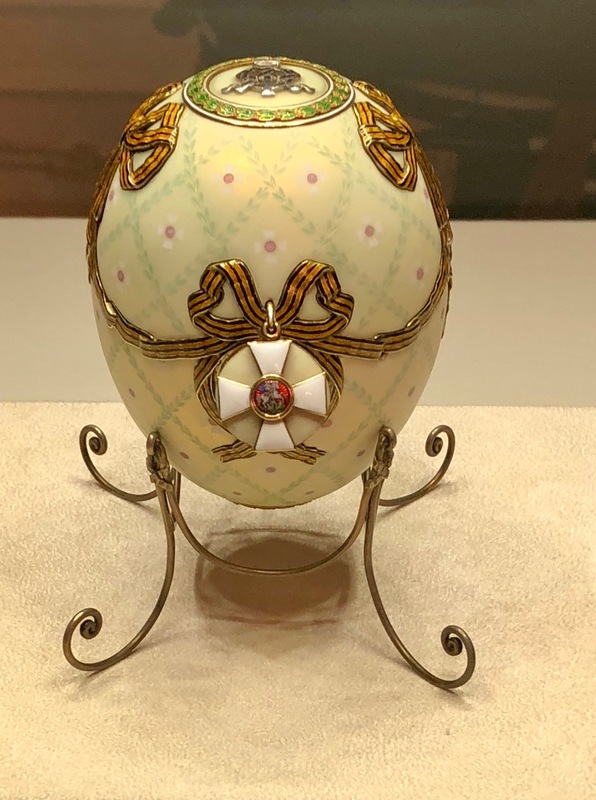 The egg commemorates the ceremony granting Tsar Nicholas II and his son Tsarevich Alexi membership in the Order of St. George, established by Catherine the Great as the highest military honor. In 1927 the Soviet government began selling the eggs. 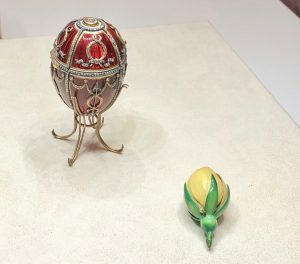 Nine eggs and 180 other objects produced by Faberge and his associates ended up in Malcolm Forbes’ private collection. In 2004, just before the collection went to auction, Russian oligarch Victor Vekelsberg purchased the collection of over one thousand pieces, spending $100 million just for the Imperial Eggs. 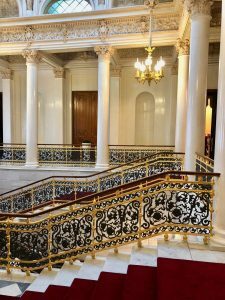 The entire collection is now on display in the Shuvalov Palace on the Fontanka River embankment. 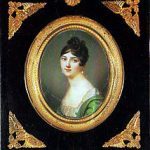 The story behind the Shuvalov Palace begins with Maria Naryshkina who was Tsar Alexander I’s mistress for thirteen years. The couple had five children. In 1846, Maria’s daughter married Count Shuvalov, hence the present name of the building. The palace fell in disrepair after World War I. In 2004 the Link of Times Foundation funded by Vekelsberg began restoring the palace to its former Neo-Renaissance style. 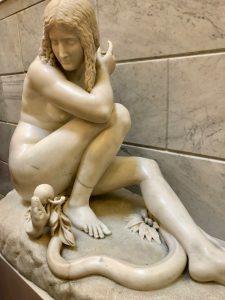 Visitors climb the Grand Staircase with its sculpture of Eve, the snake, and the apple to the exhibition rooms on the upper level. 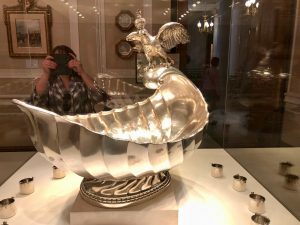 Displays open with imperial silver presentation ware in the Knights’ Hall. The silver continues in the the Red Hall, with its simple, but striking, ceiling. The imperial eggs first appear in the Blue Room. 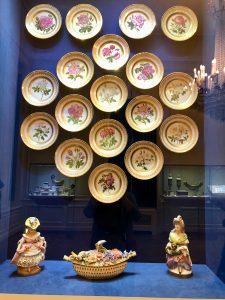 The collection of over four thousand pieces includes enameled table ware, small items given as gifts, and icons. 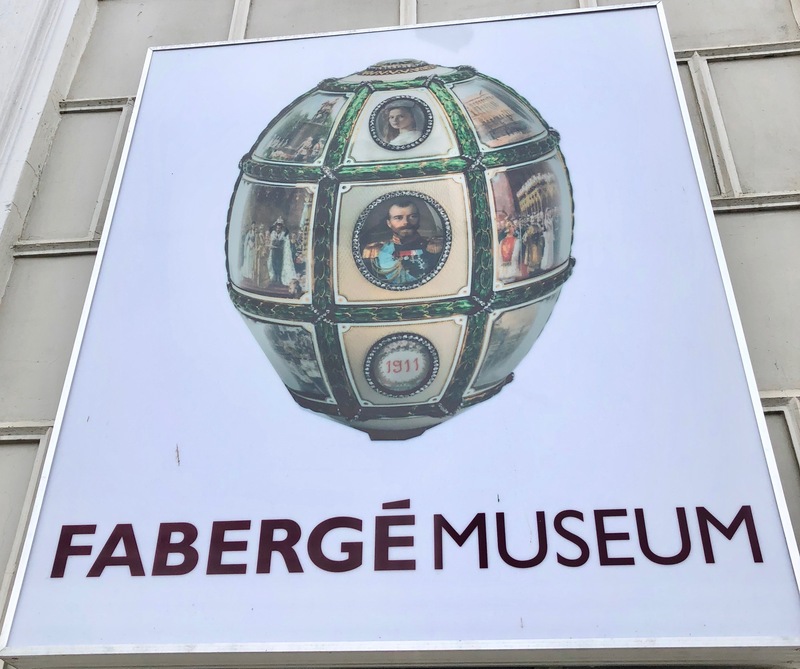 In 1918 the Bolsheviks nationalized the House of Faberge. Carl Faberge escaped St. Petersburg on the last train to Riga. He died in Switzerland in 1920. 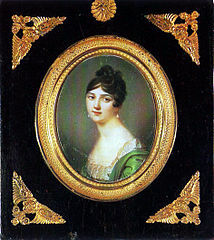 Portrait of Maria Naryshkina by Johann Dominik Bossi. Public Domain.